1:12 is the recommended maximum gradient for fixed wheelchair ramps but some portable ramps may also be used as an auxiliary aid at a gradient of 1:8 over shorter distances where assistance is provided and if an adequate risk assessment is carried out first to confirm this. A folding 1.8m ramp that weighs just 11.9kg and carries 350kg - That's Aerolight! Please contact us on 01608 663759 for further information on portable ramps. Note: this calculator is based on a 1:8 gradient - ensure that suits your requirements before ordering. Note: Access to and use of buildings: Approved Document M were updated in October 2015 and now consist of 2 volumes of the Approved Documents, a 2013 amendments to Approved Documents and Pre October 2015 edition, Approved Document M: access to and use of buildings. The 2004 edition (incorporating the of 2010 and 2013 amendments) of Approved Document M*, as amended, will continue to apply to building work started before 1 October 2015 or work subject to a building notice, full plans application or initial notice submitted before that date. 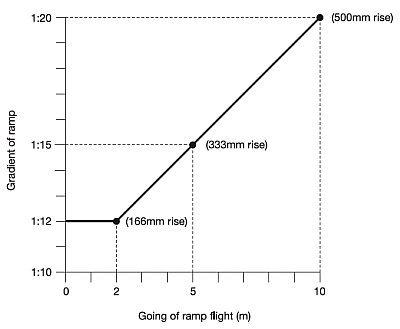 The following table shows the minimum ramp length required to comply with current UK Building Regulations from the Approved Document M: access to and use of buildings, volume 2: buildings other than dwellings Note: 10m is the maximum length a ramp should be before including a level resting platform of 1.5m minimum length. Although not always necessarily so with existing premises, it is advised that you try to adhere to these recommendations whenever possible. Note: UK Building regulations are slightly different with regard Dwellings and other building, these recommendations are for "Buildings Other Than Dwellings". Aerolight Classic - Non folding portable wheelchair ramp. Aerolight Broadfold - Single fold portable wheelchair ramp. Aerolight Extra - Single fold portable wheelchair ramp. Aerolight Lifestyle - Two fold portable wheelchair ramp. Call: 01608 663759 for free friendly advice on wheelchair ramps. There are recommendations concerning portable ramps in BS8300:2001, but in a number of circumstances, primarily with existing premises they can be difficult to adhere to. "Where a physical feature (for example, one arising from the design or construction of a building or the approach or access to premises) makes it impossible or unreasonably difficult for disabled persons to make use of such a service, it is the duty of the provider of that service to take such steps as it is reasonable"
"Reasonable adjustments" is a phrase that if you have not heard yet, you more than likely will do other the coming months. It is the so called "grey area" of the Act which will surely be a key point for the courts to decide. What constitutes a "reasonable adjustment"? - Their is no easy answer, but in my personal oppinion all cases will be dealt with individually. A new, or an existing high value property would reasonably be expected to comply with all recommendations under BS8300 and Part M.
Where as, a small local village shop, salon etc. would reasonably be expected to make minor alterations and provide auxiliary aids, such as clipboards, audio aids, trained assistance, portable wheelchair access ramps etc. If you would like to make any comments on the information displayed on, or this website in general I would be most grateful to receive them. The Aerolight Extra Wheelchair Ramp has a an average rating of 4.8 out of 5 based on 7 reviews.